To tackle action needed to improve health, Vicky Okine, President of the Alliance for Reproductive Health and Rights, led a panel of six experts. Nana Taona Kuo, Senior Manager in the UN Secretary-General’s Executive Office discussed the Every Woman Every Child Progress Report launched in March this year and the need for continued accountability for resources and results. 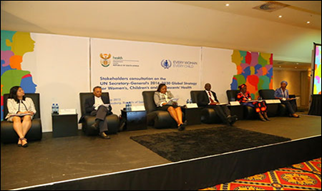 Yogan Pillay, Deputy Director General for the Department of Health South Africa, spoke on the unique national leadership required by African leaders to address the high burden of deaths. He suggested the Global Strategy must show leaders how to “leap frog” forward by focusing on six things: technology, operations, behavior change, speed, sustainability and scale. Jesca Nsungwa Sabiliti, Assistant Commissioner for Child Health, Ministry of Health in Uganda, shared how the Lives Saved Tool was used to inform the RMNCH Sharpened Plan to direct investments. A major gap identified in Uganda, shortage of health workers especially midwives, was then discussed by Pius Okong, Chairperson, National Health Commission, Uganda, who proposed solutions to addressing this challenge. Miriam Were, Member of the independent Expert Review Group, emphasized that accountability must remain central to the next Global Strategy, and should also include clear guidance on donor accountability. Finally, Vuyiseka Dubula, Director of Policy, Advocacy & Accountability at Sonke Gender Justice, focused on the need for social accountability to ensure access to care anywhere, mobilization of domestic resources and a human-rights base to health. She said, “women’s empowerment needs to be at the centre of our discussions”.